Canadian Wildlife Federation: I’m raising chickens in my backyard. How can I keep foxes away? I’m raising chickens in my backyard. How can I keep foxes away? A. Red foxes are found in every province and territory of Canada. They have excellent eyesight, hearing and sense of smell – all characteristics that make them great hunters. And if you have chickens, you may just know how great a hunter they really are! 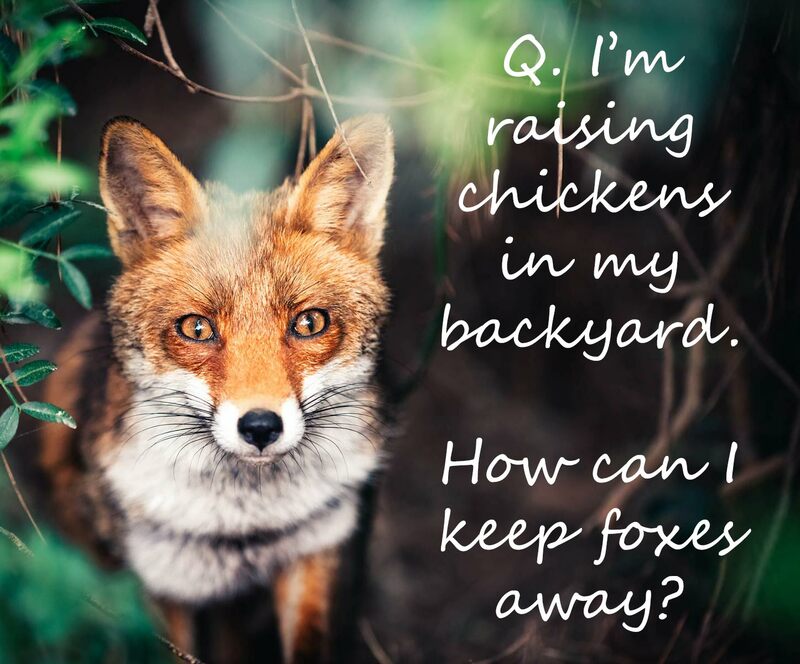 I will admit that I don’t have chickens so my answer below comes from what other people have found helpful in protecting their chickens from not only foxes but other predators as well. Make sure to use ½ inch or ¼ inch hardware cloth, anything larger and a fox could get a body part through. Chicken wire does not act as a barrier for foxes – they are able to manipulate it, and may be able to even chew through it! Attach a hardware cloth skirt around your chicken run and coop that is buried at least 0.6 metres (preferably 1.2 m) deep. Some people have also found that extending the hardware cloth out at a 90° angle (so that it looks like a backwards L) at least 0.5m wide provides extra protection. This should prevent foxes from being able to dig under structures. Covering the roof will also help to prevent foxes from getting in. It seems some people have good luck with electric fences! Although, I’m told foxes can jump over a 1.8m high fence as well as dig under it, without getting an electric shock! They may even be able to learn when the fence is on and when it’s turned off. To increase your chances of having success with an electric fence, make sure it’s 2.2m in height with an outward facing fence topper to prevent foxes from jumping over it. Be sure to use latching bolts on any openings. Some people have had experiences where foxes have been able to open twist-type catches. If your dog and chickens get along, the smell and presence of your dog may be enough to keep any foxes away! Some people have good luck with sensor lights – lights that turn on with movement. If you have low growing bushes around your chicken run or coop, cutting them back will give the fox fewer hiding spots while hunting. Red Foxes tend to hunt more at dawn and dusk, however, they will also hunt during the day especially if it’s a female with young to feed. Be sure to keep your chickens locked up at night and in a secure area during the day. Be sure to inspect your coop and run daily. Any little hole or gap is all a fox needs to work its way into your chickens.